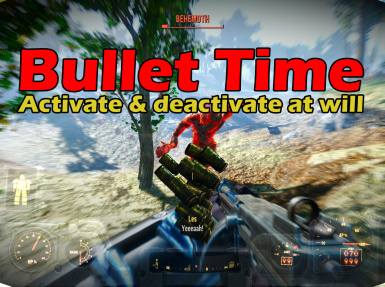 registrator2000 has made the Bullet Time mod that I have been looking for and it works great! I really recommend it. (I made mine only as a stop gap until someone with more talent than I makes a better one and have stopped work on mine). There is only one bug thus far - the second tier? It doesn't end when you run out of AP. alright, so here is the thing. I really enjoy your mod. Seriously, I know you say there is a superior one, but this one doesn't mess with any of my perks, or anything like that. 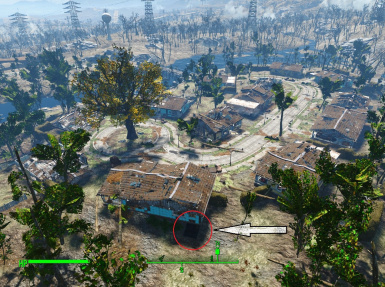 It just gives me a viable alternative to VATS (I hate the fact that melee builds are all about VATS in FO4, I much prefer the bullet time option. ) I also use criticals outside VATS mods, which make my luck give me a chance of crit, and modify 4 leaf clover. End result? Your mod which doesn't screw with any of my perks is ideal for me. In the other one, AP drain is slowed to the same amount of time that your Slow Time is set to, so you can essentially shoot for ~1 minute or so with 60AP drain. Does this mod do the same? Or is the drain consistant regardless of time dilation? It does the same I'm afraid. In the initial version, I had the progressively stronger models drain progressively more AP as a way to balance things, but it still doesn't work well. 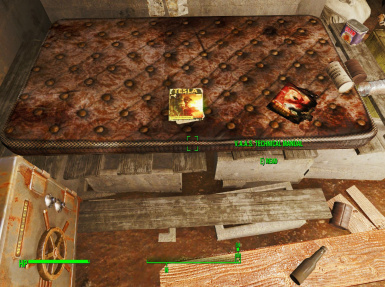 CANT FIND THE PERK MAG.!!!!! I TRY 2 DRAG THE SOUND FOLDER AND IT ASKS ME TO REPLACE . WHAT TO DO ???? SHOULD I REPLACE????? Am I to presume that, as with the other big bullet time mod, this removes the ability to "bank" cirticals, as with VATS? 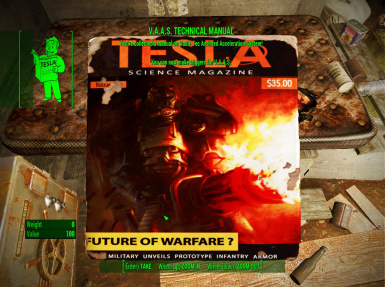 VATS is something I really kind of hate about the game, as I disdain hit chances and "turn based" play. However, the ability to "charge" and fire crits is an incredibly attractive mechanic to me, something I very rarely see. If you can't use crits with this, is it possible to port them in? I know that modifying VATS in any major way is a no go, due to beth stupidly integrating it with the game engine, but I'm not sure if it's possible to add it's functionality to other things. Yes, the ability to crit and bank crits is still tied to VATS. If you are looking to crit outside of VATS, there's a mod called "Old Style Criticals" which may interest you. is there any mod that can identify enemy or friendlies like vats does? since i use bullet time strictly, ive lost the ability to use vats to identify enemies in the distance. Yes, several mods do something like that. The magazine doesn't appear to me Someone has the same problem? I tried SkjVAAS 3.0 with half AP drain and the ingame MK1-activator and its not usable FOR ME mainly because of the Jet-soundeffect (pc yells like crazy) everytime. Maybe theres no soundeffect with the MK2, havent tried it, but that would be too slow in my opinion. Though its really well implemented, so thanks for sharing the mod - ill try another slowmo mod! yeah, i gotta admit ive tried his mod first but since im playing survival beta and his mod is based upon aids my char went thirsty after every activation so i tried yours..
Would a 1% version have the same problem as the .5% version? Not being able to move sometimes? Slowing down to a factor of 0.001% was what I initially did in the month before releasing this mod. 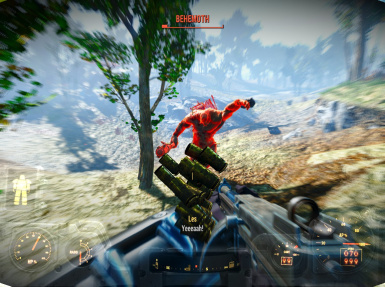 But while it's really cool to be able to zip around the splashing blood and gore when you kill an enemy, it sometimes stops the character from moving. Using 0.005 was more stable, but after another month of extended testing, I found that it caused similar issues. Seems like some parts of the game engine don't really like it when time is slowed down too much - similar with changing timescale too much. When I go into 3rd person mode, I can see my character's legs running, but I won't move. Trying to turn, jump, crouch etc helps move it a little, but I have to do it repeatedly. Was causing more grieve than benefit. So, 4% is the slowest it can go without getting buggy? Both 0.3% and 0.04% are stable so far. But I've not tested anything between 0.04 and 0.005. These are the values I used for mk1 and mk2 since they are already used by the game, so I figured these values are safe to use. Oh okay. I was hoping I could get it slower than 4%. .5% works great as a stand-still bullet-time. Like sniper bullet-time or something. With 4% I can almost run as fast as a shot of plasma. I've tested 1% with the other guy's bullet time mod, and it works just fine. And I realized I mis-read your question. You mean 1%, as in 0.01 in the magnitude. I thought you meant 0.1%, which is 0.001 in the magnitude.